Normally you'd go channel surfing with your Toshiba, but tonight I ended up doing some sailing instead. In my ongoing obsession with RL companies entering Second Life, I was doing some searches to examine the traffic counts of various RL companies. (For those of you who don't know, the "Traffic Count" of a land parcel indicates, more or less, the number of minutes avatars spent on the parcel during the previous day.) I was hoping to learn something about the popularity of various company islands. As usual, the traffic counts are completely dismal for most corporate islands. Here's a sample of today's numbers: Reebok, 1641; Microsoft Visual Studio, 974; Dell Factory, 333; Toyota, 202; Coke Virtual Pavilion, 98; Amazon Developer, 32. Today even I had 444, which is more than Toyota, Coke and Amazon combined! Among the worst traffic I found in my quick survey was at Toshiba, who have a poorly promoted island. The traffic at Toshiba Image Festival was only 66 at the time of this writing. However, I found Toshiba to be somewhat interesting. While you arrive at a tall tower, the highlight of your visit will be on a gigantic ocean-going sailing ship that is for some reason floating high in the air. I estimate its length at around 150m, but it's actually quite a bit longer due to the tusk-like extensions on the bow. You can tell its floating because you can see rotating spotlights coming out of the bottom of the hull. On deck are several interesting submarines, but they don't seem to be operable. Well, I sat on top of one, but that was fun for about two seconds only. 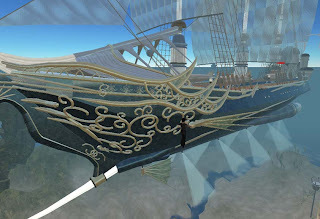 The ship build is magnificent, and clearly a massive number of prims have been consumed by the detailed features. For example, the very complete rigging that goes up the 100m main mast seems to be actually made of individual prims. The submarines have elaborate landing gear, complete with shock absorbers. Large, semi-translucent curving sails extend over the main deck. Below deck is where the action is. At first glance it appears to be some kind of cubicle farm, but in fact it's a large number of video viewing stations. Unfortunately, no one was viewing anything. I'm not precisely sure what's going on here since most of the signage is in Japanese. Outside the magnificent ship were a menagerie of animalistic escorts, including animated seagulls, dolphins, and of course flying pink elephants. What? Yes, with animated wings, too. This is all wonderful, but could someone explain what it's for? In english? Somehow I had some time this weekend to build some new effects, including an entirely new line of Teleportation effects. Snower Personal, which produces a vast amount of snowflakes around you when you wear the effect. Snower Subtle, which produces a much smaller amount of snowflakes. I am not sure which one is best for you, but now you have a choice. 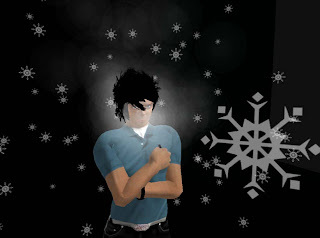 WinterKit, which includes not only Snower Personal and Snower Subtle, but also the new Breath effect. It produces a frosty breath every seven seconds and when combined with the snow effects makes the scene look very cold! RaveRinger TP produces a small blast of multicolored streaks along a randomly angled plane. It goes off only once when you teleport, like all of these teleportation effects. NightFog TP instantly produces a 10m area of complete darkness. The effect slows after two seconds and the darkness gradually lifts. This would be great for a spooky halloween entrance! SuperFog TP instantly produces a 10m white cloud all around you. Again, it disperes in about two seconds. A word of warning: the teleportation effects might be considered rude in some areas, so be very sure that you will be well received when you teleport! 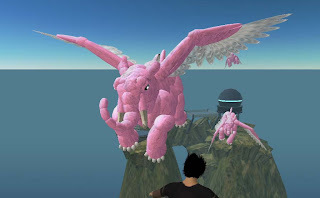 This is part three of my analysis of the ongoing failure of RL businesses in Second Life. Part one was in response to the infamous WIRED article, and part two expanded on my thoughts. In part three, we'll discuss ideas for how RL businesses may actually succeed in Second Life. So, what could a RL company do? Indirect or subtle marketing. We have all seen how the hard sell has not worked. Dell, Coke and other major RL corporations set up large Second Life operations, sometimes covering multiple islands. The islands are usually covered with logos, branding, analog virtual products, etc. Few come to see these. Why would you want to visit a billboard? What kind of immersive experience is that? We immerse to engage our own fantasies, not a corporation's! Some have gone further by arranging events or activities at these sites in attempts to attract visitors. But it's all "pull", and little genuine interest. The only successful approach I've seen is by General Motors on Motorati Island. They've created a sandbox for virtual automotive businesses within the sandbox of Second Life itself. They've out-web2.0'd Second Life! Why does this work? Simply because it promotes the cult of the car, and it does it well. A visit to Motorati Island reveals many interesting automotive businesses, including GM itself. It works because it addresses our immersive fantasies, not GM's. GM approach is very subtle, and it's a shining example of how to leverage Second Life for business purposes. Collaboration. We all know how much different a 3D meeting is from a typical conference call or chat session. There just seems to be something extra in the experience that makes it a little bit closer to reality. No, it's by no means perfect, but it is definitely better than audio or chat alone. Businesses can certainly use Second Life as a platform for collaboration, as long as they take appropriate precautions against griefers. Go Native! This is perhaps the most interesting approach, where a RL business simply attempts to compete as an in-world company. They produce products and sell them. But what should a RL company sell? I suspect they should simply do what any sensible business does: find out what people want, and then make it! Most RL businesses seem to believe that a virtual presence will lead to RL sales, but I don't see why that would be so, considering that most people use the virtual world for immersive reasons. A RL business should carefully consider their strengths and then see how they could apply in a virtual world. Retailers like Wal-Mart or Best-Buy are good at determining buying patterns and arranging easy ways for consumers to buy products from multiple manufacturers. Well, Just Do That In Second Life! A well-organized virtual Wal-Mart that is properly advertised and promoted would be an incredibly busy place. And I suspect it would be desired by many scattered builders desperately trying to attract shoppers to their small plots – and who really have little idea of how to do so effectively, as compared to the skills of a big retail chain. Builders should build; Wal-Marts should sell. After the many recent virtual bank failures, isn't it clear that a RL financial institution could quickly set up a similar service – this time backed by their solid RL reputation? Who would use a fly-by-night bank then? That segment of virtual business is theirs for the taking. And there are many other similar ideas if one puts your mind to it. But there's a problem. The problem is that even if these RL mega-corps were to set up such virtual operations they'd be profitable, but probably only make a few thousand dollars. Maybe more, but certainly not millions. Not worth their time, perhaps. Revenue would eventually top out, not because they are doing something wrong, but because there just aren't that many customers. Second Life is still just too small, at least at this point. You can make only so much money in a small city. But wouldn't it be a good position to be the premier virtual bank as Second Life's population grew? Double the population, double the revenue. Think long-term. Where will virtual reality be in five years? Ten? Start now and gain experience and reputation for the future. My Customers are Getting Old! I've been using one of those "Traffic Meter" gadgets at my store in Caso Milo to track the number of visitors. It's a very interesting device because it sends the data to a website which records the information regardless of whether Second Life goes down or not. You can visit the website (http://slbuzz.com) to obtain a detailed report of visitor counts from your Traffic Meters. The TrafficMeter can be obtained at no charge in Dirty, courtesy of the developer, Mark Barrett. By the way, you can also pick up the very useful SLStats wristwatch near that same location - it automatically tracks the places you visit and the people you encounter. According to my SLStats today, I've visited 839 sims and encountered 5,788 people so far. Up to now I've really just been observing the total number of visitors per day. Generally the traffic has grown over time, but it's always up and down. However, I noticed a strange effect taking place over time. In June when I installed a Traffic Meter at my Caso Milo main store there was a very typical mix of ages among the visitors. In subsequent months the ratios changed - in a consistent pattern. The ages of the visitors are definitely increasing as you can see in the chart. Perhaps as my avatar gets older and more experienced, he makes more sophisticated products that attract a more sophisticated clientele? I'd like to think so! As knowledge of these products increases via word-of-mouth, older avatars become aware of Electric Pixels and come by to shop? If so, where did the young ones go? This graph might be indirect evidence of word-of-mouth viral promotion, which is typically not easily measurable. Perhaps the more recent arrivals to Second Life simply don't buy as much as those who joined earlier? We know that Linden's policy changes have affected the makeup of the Second Life residents somewhat - maybe this is one of the side effects? I think a combination of the latter three are causing this aging effect at my business. But it is a little disturbing to think that new arrivals are not spending as much as they used to. Is this happening elsewhere in other stores? This week I created two new unique seasonal effects. Since Halloween is coming up, I thought it would be appropriate to have at least one effect. But instead of making a "spooky" effect like everyone else, my pal DeForest Beck suggested I make a "nice" effect instead. Thus was born the idea of the CandyGiver. It's simple to operate, as all my effects are. Just wear it and you may scan the vicinity for other avatars. You are presented with a list of names, and the one you select is given dozens of candy items. There are eighteen different types of candy, including a selection of chocolate bars, gum, lollypops and of course chocolate kisses! Don't eat too much! The other new effect is quite obvious, but I have never encountered it. "Breath" is a tiny object worn on your nose (yes, it is transparent so no one can see it). Every seven seconds it emits a puff of steam. What is it for? Winter! This is what your breath actually looks like in -20C weather, and I should know, living in a cold RL country. This is just the thing for those of you who like to romp in the snow. In my previous article on RL business experiences, I explained my theory that there are more immersionists than augmentationists, and that RL companies fail because they do not correctly address the larger market. In RL companies have discovered products that people require for their RL activities. Massive businesses have been created around these needs: fast food, clothing, entertainment, manufacturing and many others. Business that do not address RL needs generally don't exist because they die out. A RL company produces perfume. Second Life has no means of implementing a sense of smell, so a perfume product simply cannot be created. A RL company produces food. 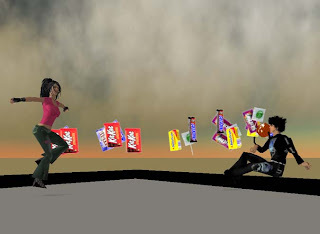 Food objects can be created in Second Life, and to some degree might be animated to emit steam, sizzle or slowly disappear as they pretend to be consumed. But no one “needs” food in Second Life. Second Life “Food” is merely decorative, adding to the rich visual experience (but not the smell or taste experience). A RL company produces clothing. 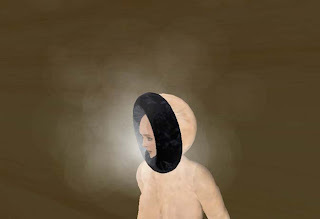 Clothing is commonly created and sold in Second Life, so you might figure that clothing can be routinely “carried over” between worlds. However, there are subtle differences between RL and Second Life that can affect the clothing experience. Avatars are have different (often exaggerated) size and shape ratios, making the clothing hang differently, color and texture appear somewhat differently due to visual resolutions. RL clothing stretches and moves; Second Life clothing doesn't. These subtle changes can mean the difference between a successful clothing item or a failure. As in RL, Second Life clothing is decorative, adding to the rich visual experience. Hey, didn't I say that already? Yes, I did. Because there is a clear pattern here. 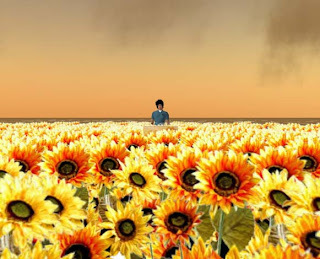 The visual richness of many successful Second Life products directly adds to the avatar's immersionist experience, perhaps because of a deep and powerful psychological effect where RL memories or concepts are visually triggered. Like art. Second Life products are essentially a kind of artwork. I recall a long time ago I learned that the measure of art is not what it looks like, but instead how it makes you feel. That's what's going on with the successful products. That's why they sell. A RL running shoe is sold because not because it looks cool; it sells because it makes the owner feel cool wearing them! A Second Life running shoe sells because it makes the owner feel cool, or get closer to their immersionist universe. A RL shoe sold in Second Life does not sell just because it is a top seller in RL. It must also make the owner feel cool or otherwise aid their immersionist vision. I know this to be true since my customers very often “Oooh” or “Ahhh” when they see products I have built. Like clothing, RL products cannot simply be duplicated in Second Life. The only market for duplicates is the aficionados who are already weirdly compelled to buy, like someone who collects Coke paraphernalia. And bad news for the RL company: the aficionados probably already own that product in RL and few net new RL sales are made. Now you might think there are some exceptions to this. For example, some successful Second Life products are gadgets of some kind. I suggest, however, that the ultimate purpose of most gadgets is to indirectly add to the rich visual experience by simplifying steps to achieve that experience. Consider the numerous HUDs that allow the user to more easily control their rich visual experience. So my bottom line is this: successful Second Life products should add to the visual experience, either directly or indirectly. By now RL companies must be asking, “but what can I do in Second Life? How can I make money like I do in RL?” I think there are some answers, but that's something I will save for another post in coming weeks. I had an idea to use particles to create life-like vegetation, and it seems to have turned out rather well. After some experimentation and a lot of photoshopping, I first built an effect that emits grass! 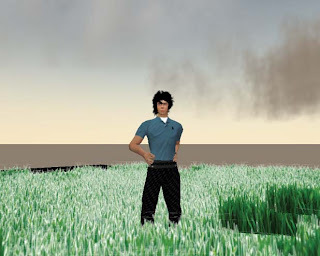 Once triggered, grass flows slowly away from the emitter as shown in the photo. This emitter has some interesting properties. First, you can raise or lower the height of your grass merely by moving the emitter up or down. As with all of my installable effects, the emitter is MOD so that you can blend it into your site, or even make it completely transparent. I really wanted to create a wavy field of grass, much like you would see on the prairies. But unfortunately, that's not how particles work. You can't easily make individual particles change shape - you can just make them move and stretch - but not wave. However, I had another idea! It came to me as I watched the grass particles slowly flow away from the emitter. If you place several Grass emitters separated by say 10m or so, their grass particles inter-weave together and create a bizarre flowing carpet of grass. Not exactly waving grass, but pretty close and very fun to stand within. Once Grass was made it was straightforward to create two additional effects: Flowers, which emits a selection of wildflowers, and Sunflowers, which emits.... oh you can guess that one! All three of these new particle effects are now available at the Electric Pixels Particle Shop in Caso Milo. Does anyone have any suggestions or requests for other types of vegetation?